A teacher friend once described the month of August as one long Sunday night, with educators, students and parents all mentally preparing for the start of school. While you are busying packing up the pencils and notebooks for the new year, pick up a begonia as a gift for yourself, a teacher or student, as a reminder that there’s always time to stop and smell the roses while this busy time of year begins. 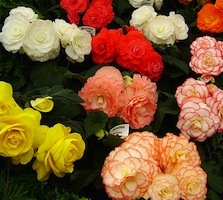 While the begonia does not have much of a fragrance, certain types are said to symbolize cleverness and popularity. 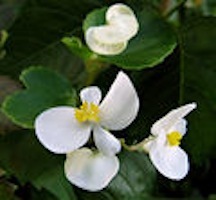 Named for a 17th century governor, Michael Begon, by the famous French botanist, Charles Plumer, the begonia got a bad rap for having a name that sounded like the word “beware” in Latin. 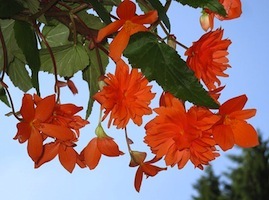 In the Victorian language of flowers that was all the rage at the time, the begonia was sent as a message of warning. With hundreds of different species in three different subgroups, it is unfair to associate all of them with caution and imminent danger. In the 21st century it’s time to reclaim this large group of lush flowering plants and have them symbolize the upside of wariness, which includes adventure, opportunity, and the wonderful feeling that something big is about to happen. These shiny-leafed little bloomers are adorable little bedding plants that look great in a container outside a classroom or in a pretty pot on the steps of that new college apartment. They come with dark, reddish leaves and white or red flowers and lighter, waxy green leaves with white, red, pink or coral colored petals. Fun and easy to grow in shade or partial sun, these dainty little plants are a fun gift that will keep on blooming as the leaves begin to change and midterms begin. The 2.0 version of your typical bedding plant begonia, these larger plants with huge double-petaled blooms grow from a tuber-like corm and can be grown inside in a bright, sunny window or outside in a hanging basket or container. The plants can trail over the sides of the pot with large blooms in white, red, salmon, yellow or orange and are absolutely striking. 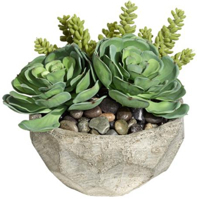 Voluptuous with their ruffled petals and pretty leaves, these plants are a breath of fresh air when a teacher or student needs to stop and take a deep breath. 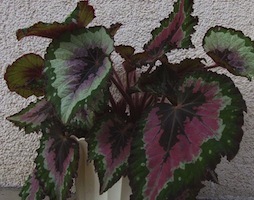 Show stopping houseplants with fanciful leaves, this subgroup of begonias would have millions of followers on Twitter if it had thumbs to text with. Large and showy leaves have silver, red, and purple designs on them and a range of exotic looking flowers that will bloom from time to time throughout the school year. The only thing to be worried about with this begonia is that you won’t be able to stop at just one.